I have had contact with mystical places that are time travel portals and are entry gateways for the ET ships and ultra dimensional beings. The Ancient Ones that I meet on the mainland live in places like that. The portal at Sky Island Ranch is activated during certain ET contact gatherings that occur at night. Generator sounds (electrical sounds) from underground or from boulders. Spheres of Light-white, golden, blue, orange and red - called Dreamwalkers by the Ancient Ones. Overhead flashes of light filling an entire area at the tree-top level. Missing Time i.e. time dilation effects due to the attending portals. Timeline 'distortions' witnessing past and future locations in the present. Easy communication via holographic Telepathy. Visions as a way to communicate information to you. Shape shifting into animals and each other. Voice projections from miles away, easily heard as if next to you. Ancient symbols carved on rocks and trees. 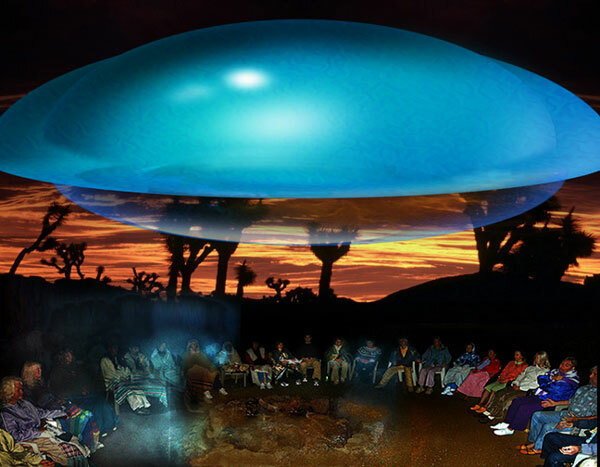 One night while participating in an ET Contact gathering with Dr. Steven Greer, twenty-two people were all sitting in a circle, mostly being quiet while observing the sky. We were individually, slowly, moving into an altered state of consciousness in this location of numerous ETV sightings from past years. We were experiencing a number of unusual phenomena that night and we were all in a state of high alertness because of it. Steven had invoked the presence of our ET friends and we could feel a change in the energy field around us. Although we could not see them yet, we could feel them with us. As we sat in the midst of miles of remote desert, we noticed a bright blue light shining from between two boulders, high on the nearby rocks behind my section of the circle. It was a brilliant turquoise light with a bright white center, radiating out. The shade of blue is actually hard to describe since it was a more beautiful color than anything I had ever seen before. Our group of people silently observed this and remained quiet, while expectant. Everything around us had become extremely quiet, not a sound could be heard: no wind, no coyotes, no buzzing bugs, no people or cars anywhere. An uncanny silence surrounded us within an atmosphere of rarified air. Suddenly we were shocked out of our peaceful state by a loud cracking noise right next to us. CRACK! As if a tree had been split in half by lightening and was about to fall on our heads. Next to my canvas chair just outside our circle, a young multi-trunk sapling over 15 feet tall, bent all the way down to the ground seemingly of it's own volition, and sprang back up again, rocking back and forth from the force. We all jumped in our seats at the sudden, deafening noise. The intrusive sound seemed much too loud to come from that tree. Our altered state of consciousness was not prepared for this rude awakening from our contemplative state! Interestingly, everyone remained in repose, waiting. A field of thick energy was palpable around us. Then Steve softly said, "Everyone stand up." We stood, and naturally reached out our hand to each other forming a circle. Feeling a presence near us, the circle opened, forming a line with the cracking tree behind our backs. We began slowly walking forward. In the darkness we could not see anything yet, but we could feel it. Involuntarily, I began shaking from the frequency around us. Concerned that I would disturb the people holding hands with me on each side of me, I decided to ground myself, intuitively understanding that this would stop the shaking of my body. With my eyes partially closed I visualized the energy in my body going down into the Earth to connect with the earth and stabilize me. I saw this energy field from me to the Earth as a golden light. This seemed to work as I continued to run the energy through me and stopped vibrating, becoming more quiet and meditative. Remaining in this state with my eyes soft and half closed, I suddenly noticed a brilliant space ship hovering near us within our line of vision, straight ahead. 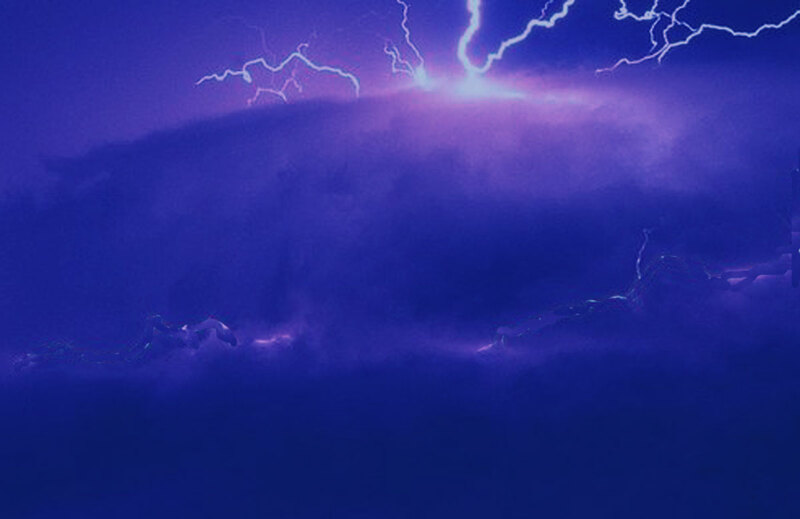 This was a beautiful, completely physical, dome shaped craft that was radiating an iridescent blue color over most of its surface with bright white light streaming down from the bottom of it. It was about 30 feet across and only 50 feet away from us. It took my breathe away to see its beauty and easy proximity to us. Starring at this vision of precise construction of an unknown shining, translucent blue surface, perfectly smooth with no hinges or seams in the shell, I was overwhelmed and blissful. I felt in complete harmony with it and (I can only say) in love! It remained hovering there. I was mesmerized and wouldn't take my eyes off of it, drinking in the beauty of this superb hovering craft. Eventually I began to notice or feel that some of the other group members were not looking at it. I realized that some people were not seeing it. Next to me was standing a friend who had attended the gathering with me. He seemed unaware of the presence of this splendid ship. He seemed to be looking around and even a bit fidgety. Wanting him to see it too, I risked breaking my concentration, without averting my eyes, to whisper to him to "squint, squint!" I knew better than to try to explain in detail what was happening around us. Had I began a long, explaining sentence I could have lost my own connection to it. I was hoping that if he changed his way of looking from staring straight ahead, to using 'soft' eyes, squinting and becoming meditative, he could see it too. He didn't understand, and later with frustration, he asked me why I kept whispering, "Squint, squint" to him! I explained, there was a small ship hovering near us, but it could only be seen if we stopped searching the sky with "hard" eyes, relaxed our gaze and became meditative and "right" brain. In this way, I learned that not everyone had seen the craft. Out of the twenty two people, eight of us including Dr. Greer, had seen it and described it in detail, the exact same way. It was a breath-taking experience. This wonderful translucent blue vehicle remained in place for an indescribable length of time, resonating silently, as we all stood in a line, holding hands and facing it. Then it slowly rose upward and disappeared instantaneously. It was very difficult to talk after the encounter. We were deeply moved. For most of the people it was their first experience of an ET vehicle. I know we were all changed by this craft whether we could see it or not. It was uplifting and seemed to fill us with a wisdom that would enter our vibrational speech patterns, reveal itself in our work and express itself in our conversations in our individual daily lives from that time on. On numerous occasions I have witnessed similar experiences where some people see the ships or the ET beings, and others do not. What is the logical explanation for it, I do not completely know. But it is a well documented phenomenon.